My know-how lies mostly in electronics. I could not turn special mandrels on machines worthy of a place in the Science Museum. I just have a small home electronics lab. On my conditions of work: I wanted to make a prototype, not a player for serial production. I still made some drawings, which could be used for mass production - if there were a mass market. The cost would not be very high. I believe I have spent less than 50 euros in all on this player, but it did take me some time. I am indebted to several persons, particularly Madame Steger (see her site www.phono.org) whom I have repeatedly disturbed to discuss improvements. Finally, this player, which is capable of recording, is a standalone device, like an old record-player. Thus it has its own amplifier. It is built on an Edison Standard player, and I have mainly chosen original solutions for this time machine. - These motors have a large number of poles per revolution (48 in my case) and do not cause as much vibrations as the old governors with three weights per revolution. - Normally these motors run at slow speeds, and I had to resort to some electronic tricks to make them run at 200 rpm without damage. - The control of these motors is digital and their speed can be found out from the controlling electric signal. 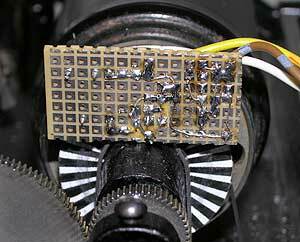 This is not the case with DC motors, which will slow down with increased load. - To filter out the jumps from one step to the next, a flat belt transmits the rotary movement to the mandrel on the Edison player. 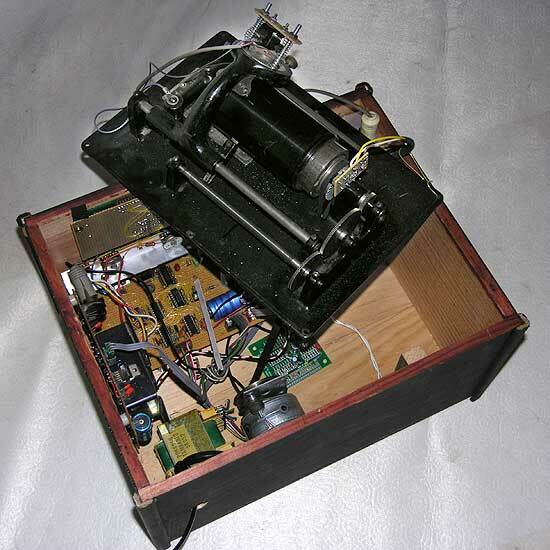 The whole player, the stepper motor at the bottom of the box. It is a low noise preamplifier with an active frequency filter. The output level is compatible with any recording device. The preamplifier is of the same type as the one used to record discs, already covered on the page "parenthèse technique" (on my site, se link below). This is probably the heart of the problem, and I have tried different solutions. 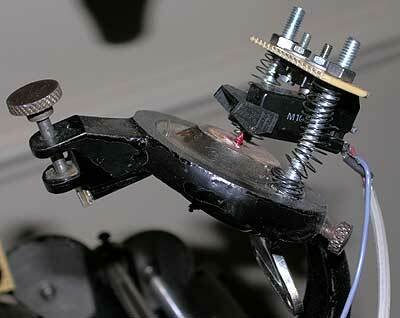 First I tried mounting a tonearm from a turntable, without much success. It was almost impossible to play en entire cylinder with no skidding, and I had to reassemble the pieces of recording afterwards. Also, as the cylinders were often oval, the inertia of the tonearm made it jump vertically in a motion that was almost impossible to damp out. So in the end I went back to the old Edison system, replacing the acoustic reproducer by a magnetic cartridge. This mounting, more than a hundred years old, is probably the best. No more questions about the weight of the cartrigdge in the groove, only pressure. No more inertia. The mounting will also permit future improvements, like some lateral freedom of movement of the stylus in order to let it come down precisely in the groove, like a bowling ball in the gutter. original sapphire mechanically connected to the cartridge stylus. Even if the speed of the mandrel depends directly on the signal from the motor regulation, I found it important to display the exact mandrel speed. A device built around a programmable circuit from Microchip (often called "PIC") and an optical transducer proved to be completeley satisfactory. - The versatlilty of the programmable circuit and the possibility it gives to modify the measuring and display of the result is unequaled compared to a non-programmable, "wired" solution. It also permits developments that will be made in the near future. At the moment, they are still in the experimental stage. - The speed measurement is based on a wheel with 30 black segments on a white bottom. A simple printed paper was glued to the mandrel and a small angle holds the transducer. You may now wonder what all this sounds like. 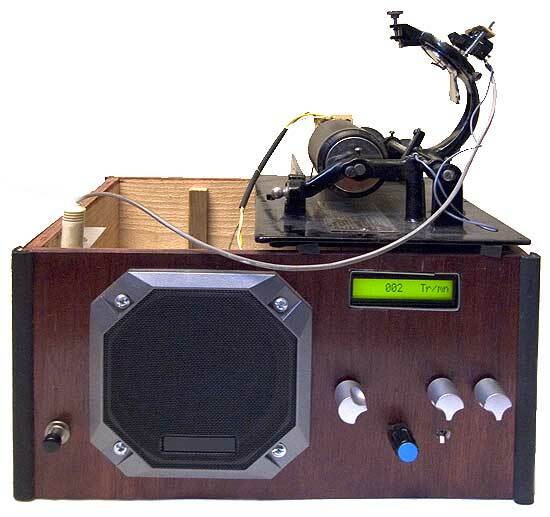 Well, why not listen to a Polin black wax cylinder: Elle m'a eu, recorded by Edison. 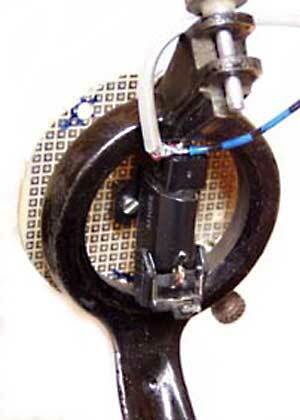 - first of all the positioning and freedom of movement of the magnetic reproducer must be improved. At the moment the sapphire can't move at all and it sometimes places itself between two grooves. This is a mechanical problem, and it should be easy to solve. - there should be a choice of a few fixed speeds (120 rpm and 160 rpm) programmed in the microchip. This should not be too difficult either. The greatest difficulty would be making the drawings, so I say: See you again on this page!